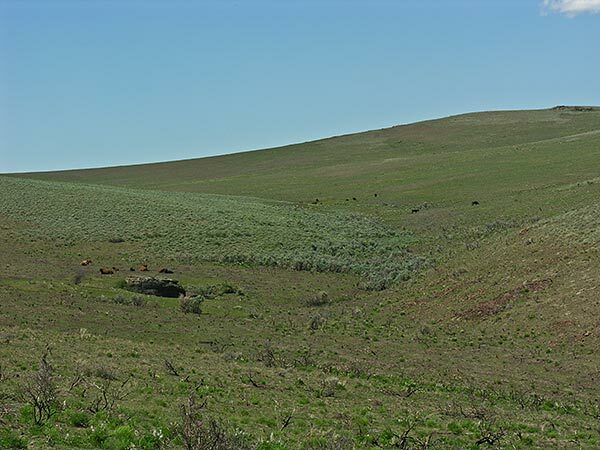 The land needs to rest from cattle grazing for several seasons after a range fire, but here they are on the tablelands above Jackpot, Nevada, grazing part of the Murphy burn. The sagebrush area is unburned, the rest is obviously burned. Grazing a burn weakens the newly sprouted perennial grasses — the good grasses — in favor of the fire prone annuals. I did notice the cows left the lupines and death camas completely untouched. I had to wonder if the future of this draw will be pretty poisonous flowers? I saw quite a few pronghorn in the general area, and it is also obviously important deer and elk transitional and maybe winter range, but cows seem to come before everything else. Update. June 24. The BLM is going up to the area to get the cattle off the burn. They are not supposed to be there. it’s shameful that they’re stocking that burn. Just more proof that they don’t give a damn.